Global Travel Media » Blog Archive » IBTM 2018 Gothenburg and Associations World Congress announces the programme for 2019 at IBTM. IBTM 2018 Gothenburg and Associations World Congress announces the programme for 2019 at IBTM. The extensive programme was launched at IBTM World in Barcelona on Wednesday 28th November. In recent years, Gothenburg has taken up the fight with the European capitals on the title of most attractive meeting place. 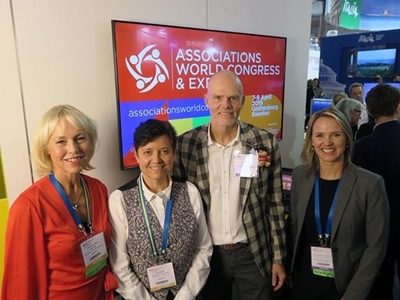 On 7 – 9 April 2019, Sweden’s second city welcomes the Associations World Congress & Expo (AWC) to the Swedish Exhibition & Congress Centre (SECC), for the first time in Scandinavia. “We are very excited to launch a new and progressive programme for the next congress and to have the opportunity to share an amazing venue and city with our delegates in Gothenburg next year.”,says Damien Hutt Director of Association of Associations Executives that organises AWC. “We have put a lot of effort together with the city to plan the program and give it a Scandinavian touch. MCI Nordics will showcase the best of Scandinavia in the very heart of Scandinavia and we have also put an exciting social and technical program together to inspire the delegates”, says Per Ankaer, Director of Sales at MCI Nordics. “The meetings industry is of vital importance for the city. It brings talent and decision makers to the city but also contributes to national and international collaboration by bringing academia and the business community together”, Ms Flyborg comments. Recently the Swedish Exhibition & Congress Centre, presented the third phase of its expansion plans in launching a competition to design its fourth hotel tower. The aim is to achieve a total hotel capacity of roughly 1,600 rooms by 2025. Being a destination that takes sustainability seriously, the Associations World Congress & Expo has been awarded an environmental diploma for implementation of measures satisfying the criteria in the Swedish Environmental Base standard requirements.